Bidding on Shaquille O’Neal’s luxury Porsche Panamera reached just $52,400 on eBay, well below its reserve price. How much value does the phrase “celebrity-owned” add to a used vehicle? 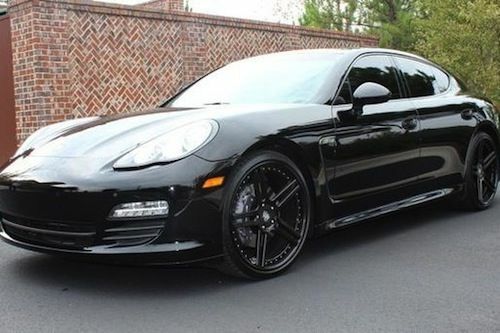 Not a whole lot, according to the recent eBay listing of Shaquille O’Neal’s 2011 Porsche Panamera. The luxury vehicle once owned by the 15-time NBA All-Star and 4-time NBA Champion failed to meet its reserve price, reaching just $52,400. Due the listing’s failure, C2G Motorsports, who currently possesses the vehicle, has turned to AutoTrader to unload O’Neal’s former ride. The Panamera is currently for sale on the site for $74,999, before taxes. So what will the buyer get for nearly $75,000? The purchaser of O’Neal’s lightly used Porsche Panamera will receive a luxury car with high-end custom wheels and extra legroom. West Coast Customs, the popular California shop featured on MTV’s Pimp My Ride television show, took care of the vehicle’s modifications. The customization shop equipped O’Neal’s Panamera with 22-inch, 3 piece Modulare wheels and moved the driver’s seat back to suit the athlete’s 7 foot 1 inch tall frame. Despite the high-end wheels, the former NBA star’s ride is mostly factory. In fact, O’Neal’s Panamera is a 6-cylinder Panamera 4, and not the more upscale V8 Panamera or 500-horsepower Panamera Turbo. O’Neal’s former ride touts a laundry list of standard luxury features like ventilated seats, a factory navigation system, climate control, multi-function steering wheel, all-wheel drive and a dual-clutch automatic transmission. The vehicle has 15,600 miles. KBB.com indicates that a 2011 Porsche Panamera with similar mileage and features is worth just under $65,000 in excellent condition. This estimate includes premium wheels, but not the specific Modulare wheels that O’Neal’s Panamera boasts, which retail for roughly $1,400. Also not included is that added cost incurred for legroom extension. Aside from the Panamera, O’Neal’s car collection has included countless vehicles including a Ferrari 456, a customized Mercedes-Benz S550, a stretch Lamborghini, custom International CST truck, and a fleet of Bentley models. O’Neal’s former Cadillac Escalade SUV, which doubled as a cop car, was previously listed on AutoTrader last year with a $25,000 price tag. Click HERE to view O’Neal’s 2011 Porsche Panamera on AutoTrader.